Yes, we’ve all seen hamster wheels of some sort, whether it be the old-fashioned wire wheel, or the new-fangled plastic balls. This little critter couldn’t be bothered with such nonsense. When he wants a real workout he takes a spin on the old tool sharpener in the garden. He must be on steroids to turn that thing. 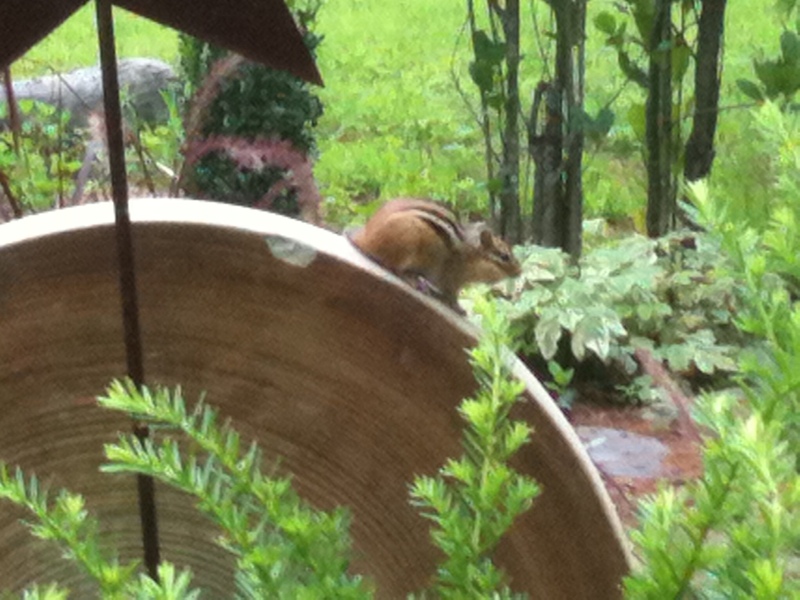 Typically our yard is a speedway for scurrying chipmunks. But this year the Chippy population is down. Someone told me that the snowless winter may have killed off a lot of the little rodents, since they had no insulation to protect their burrows. Fact or fiction? Your guess is as good as mine, but I know we have substantially fewer chippies and squirrels this spring. Regardless of the toll this past winter may have had on our mini-rodents, this scene captivated Charles as he left for work one morning. He whipped out his “life-line”, my nickname for his inseparable iPhone, and he captured this little guy on his sunny garden perch.